For some candidates who missed UTME registration, attention will be diverted to universities, polytechnics or colleges of education who don’t require JAMB UTME before they can offer you admission. Direct entry candidates may want to take advantage of such opportunity too if they miss DE registration or they’ve just completed their NCE or ND programme when JAMB has closed portal for DE registration. You should be thinking you won’t be able to make it to universities without JAMB, you’re wrong. If you know what others are doing to bypass JAMB to gain admission to universities, I guarantee you a degree certificate. Below is the list of those universities you can enter without JAMB and corresponding programmes they offered for such admission seekers. The list will continually be updated. Check back or subscribe please. 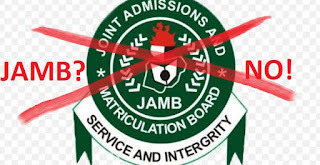 As a matter of fact, to gain admission into Nigerian institutions full time programmes, candidates must pass through JAMB. Hence, you’re are required to write JAMB UTME before you can be offered 100 level admission into our universities. What of Full-Time Degree without JAMB? However, if you still want to avoid writing UTME, you can consider some universities 12-month programmes that will only require you to obtain Direct Entry form after completion. After completion of any of the above programmes, you will obtain Direct entry form which doesn’t require writing UTME. It’s through the DE form that you will choose any interested university you wish.